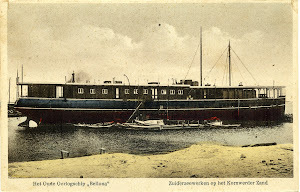 An item reported that after a successful trial the steam tug Beta was delivered by the Machinefabriek Straatman, Dordrecht, Netherlands to W.Th. Arends, Oud-Gastel, Netherlands. Dimensions 20 x 4,60 x 2,25 metres. Machinery consisted of 1-175 ihp vertical triple expansion steam engine with surface condensation and a boiler with a heating surface of 62 square metres and a pressure of 15 kilo/square centimetre.